Autumn decorations truly enhance our most favorite season of the year. Mary and I love the rich vibrant colors, falling leaves, and carved pumpkins. 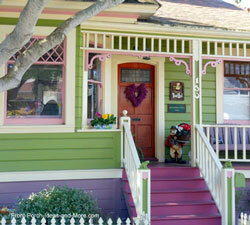 Crisp mornings, soft evening suns, along with decorated front porches embrace the season with warmth and curb appeal. 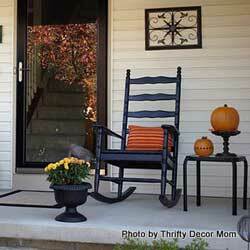 We hope our fall decorating ideas inspire you to create your own delightful autumn porch. 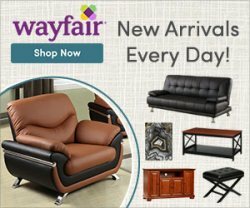 Our collection of wonderful autumn decorating ideas offer you a myriad of unique decorating styles from which to choose. 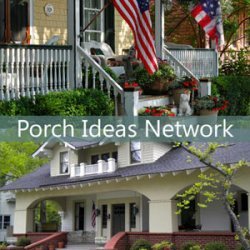 Could you make a similar display for your porch? 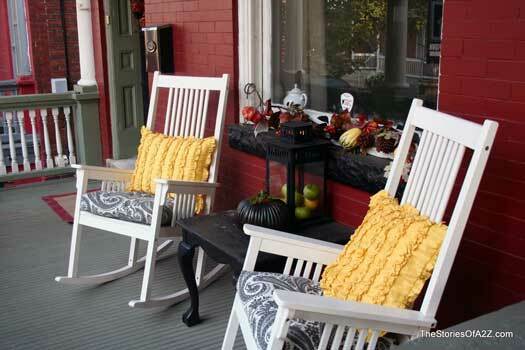 We begin with Beth's autumn porch, rich in color with lots of fall appeal. 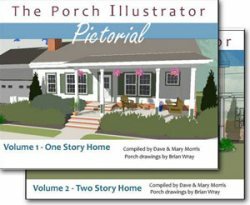 Beth, author of the popular blog Home Stories of A2Z, shows us how to decorate a porch for autumn in a most beautiful way. 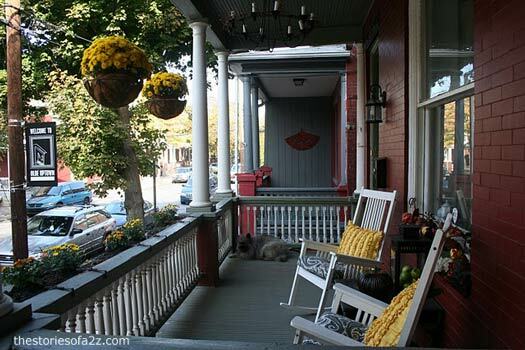 Beth's front porch is a beautiful example of using simple elegance to create a warm, inviting outdoor area. 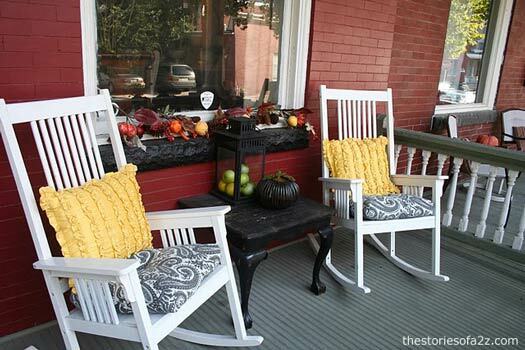 Notice how well the rocking chair cushions, floor, and hanging basket colors complement each other - the grays, whites and yellows against the red brick. We often overlook how color can easily create the effect we desire. What's even nicer is that Beth purchased the cushions for $6 each (originally $72)! Now that's a perfect find! 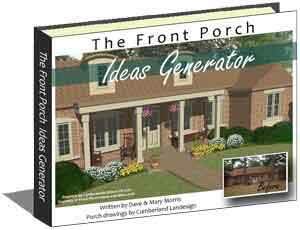 Take note of her porch railing gate; it really adds appeal on its own. The gate is perfect for controlling pets or protecting little ones. Speaking of pets. 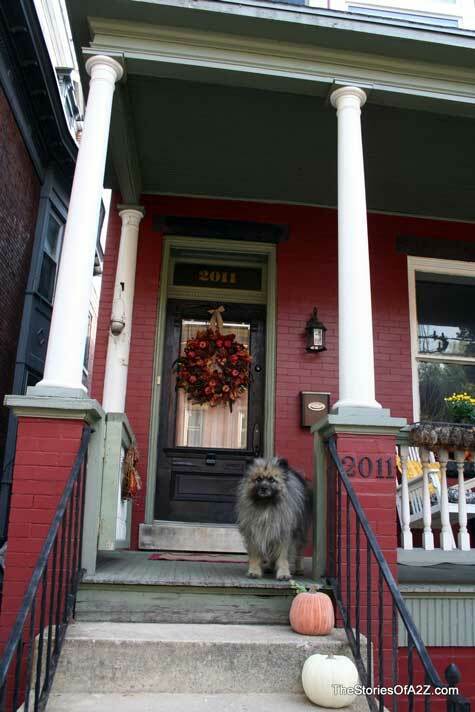 We had to include this photo of Beth's Keeshond, Gandalf the Gray. Beth writes: "Gandalf makes for a great fall and winter accessory, don't you think?" This is a gorgeous fall wreath made from feathers, berries, pine cones, and pomegranates courtesy of Beth's sister who purchased it from Costco. 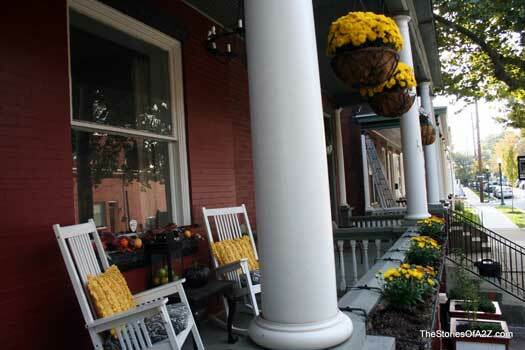 Imagine curling up in one of Beth's rocking chairs on a crisp fall morning with a cup of coffee to watch the world go by. A lovely way to pass time. We are very grateful to Tress for sharing her autumn decorations with us. 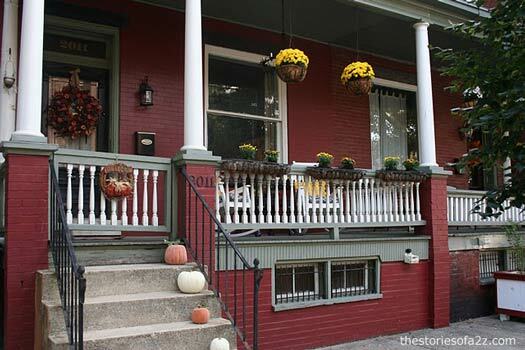 Mary and I would love to replicate Tress's style of fall decorations on our front porch. How's that for curb appeal. 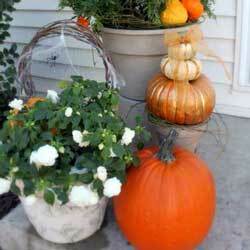 Tress has a way of taking the ordinary and making it extraordinary for fall decorating outside of your home. 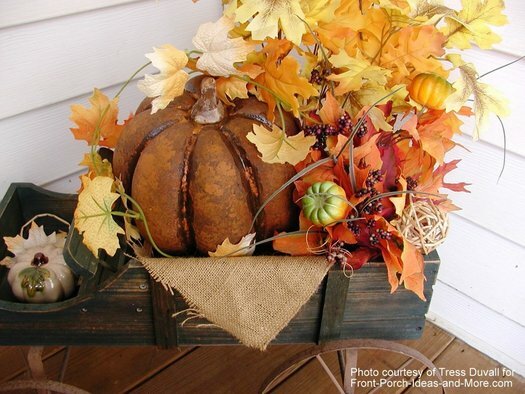 We love the wooden wagon and the beautifully colored pumpkin. 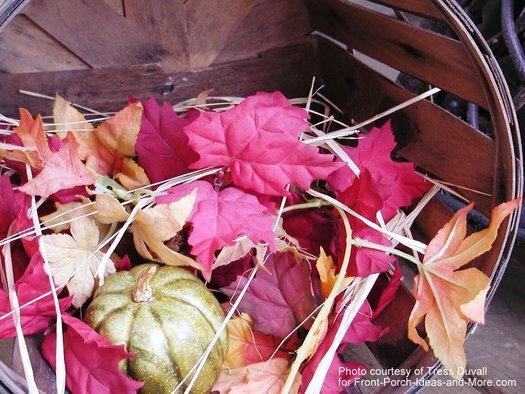 Turn an old orchard basket on its side and fill it with colorful fall leaves. Simple yet elegant autumn decorations. 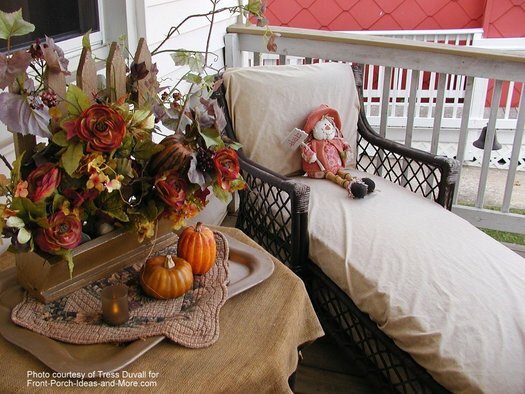 Would love to spend a quiet fall afternoon on Tress's chaise along side her table decorated for autumn. How comfy does that look? 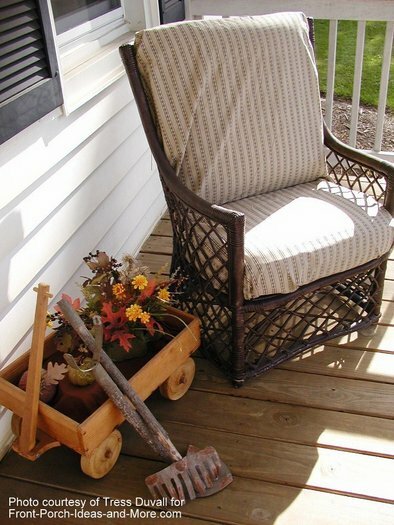 The little garden tools add a nice touch to this serene autumn scene. 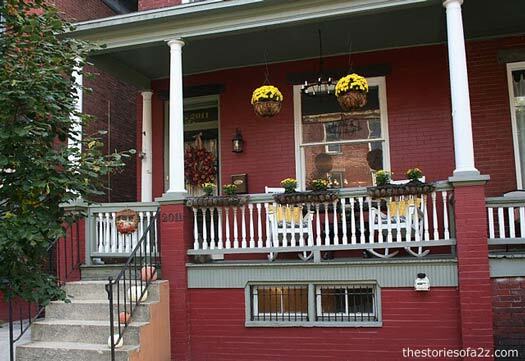 It goes to show it doesn't take a lot to create fall curb appeal. 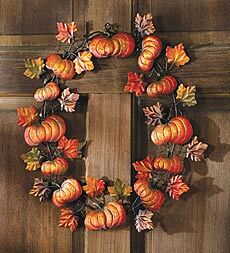 Like Beth above, use an autumn wreath as one of your primary front porch decorations. 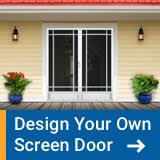 You can make one yourself or purchase one to complement your overall decor. 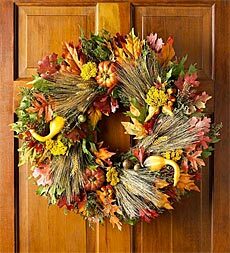 Here are a few examples to get you started - be sure to see our entire front door wreath section (link below). 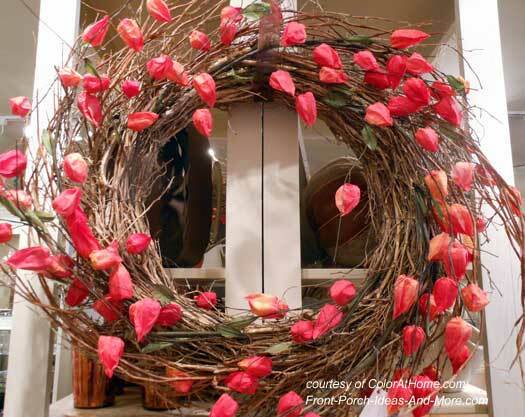 We really love this Japanese lantern wreath that we saw at the Color store in Nashville. Its delicate look adds autumn allure. 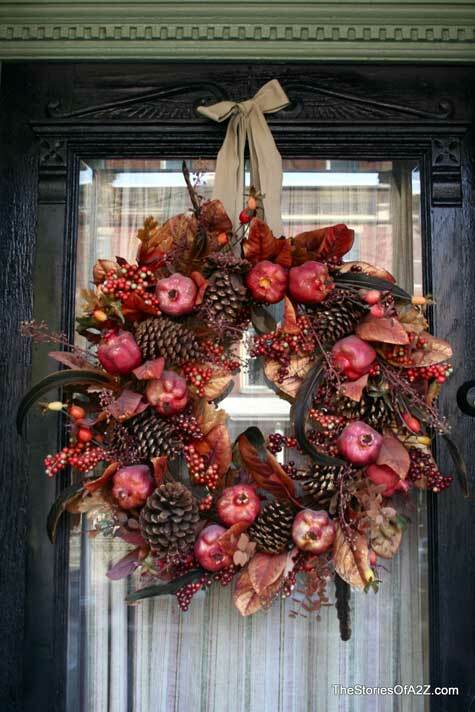 Traditional fall wreaths, like the ones above, are classic and always in style. 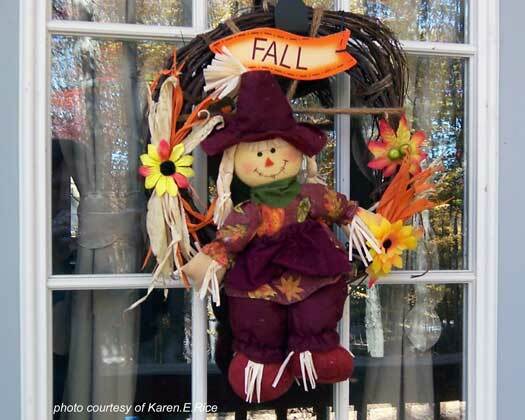 Karen's scarecrow wreath is sure to bring a smile to all who visit during the autumn season. 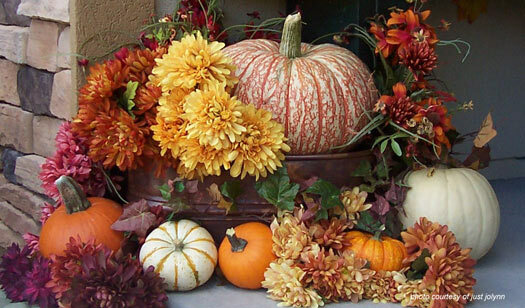 These were just a few of the many fall wreath ideas we have for you. See more below. "Home Stories A to Z"
Beth is the author of "Home Stories of A to Z" and she enjoys creating beauty from chaos. 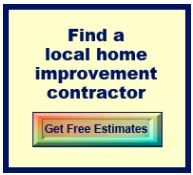 She says she has no special talents, but if you see her blog, you will be pleasantly surprised at all the beauty and goodness she has created at her home. Her boys are named Asher and Zephan; hence A to Z! We love that. 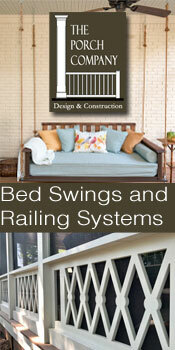 Beth has a fun and helpful blog full of DIY projects. We most definitely appreciate her sharing her autumn decorations with us. 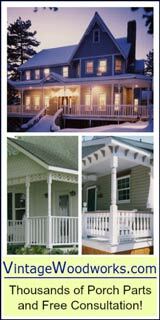 Enjoy visiting Beth's blog: Home Stories A to Z.